So apparently there have been quite a few people having issues with receiving duplicate credit for ships they already own from the list despite not having all the ships on the list and wondering why. The reason why is because Support says that receiving duplicate ship credit from the Santa Boxes is intentional and that the statement from their website is false. "If you get a ship that you already own, it will automatically be swapped for a different ship from the list." So according to support, if you get a ship from the list that you already own, you DO NOT get a different ship from the list. Below is their actual reply. Thanks for contacting Wargaming Support. According to our logs, you've been compensated 3 times for the ships you already have from the gifts purchased on 2019-01-06. Also, actually, this is how it works, and there is nothing wrong with it. All the rewards are distributed randomly. So it doesn't mean that if you receive the ship from the gift, you won't receive it (its compensation) from another one. I'm sorry but there is nothing we help you with in this case. If you have any other questions or issues please do not hesitate to contact us at any time. Then what do we get in compensation? Doubloons apparently. They say that if you purchase a lootbox, the ships are ALREADY in them even if you don't open them. So if you purchase them from the tech tree, then open the loot box, the ship won't be swapped, you will just get doubloon credit for the lootbox ship. If you get gifted a ship that you already own, say T-61...it'll pop-up in a regular box (not the red Super Container.) It'll show the ship's name above, with the 10-point captain. Over on the right hand side, the pop-up information box will briefly show itself, and indicate that you've had 4,600 doubloons added to your account. The 10-point captain will go into your reserve. 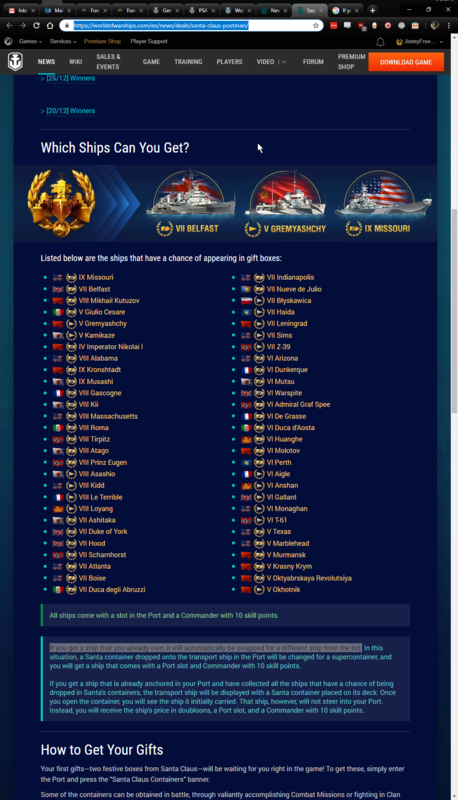 WG website says one thing and WG does another? The point is, their website says if you get a ship from the lootbox that you already own, you will receive a different one and they aren't doing that. I don't have all the ships on the list. True--they're not being 100% honest. If you own every Premium ship except Missouri, buying Santa Gifts does not guarantee they're going to gift you a Missouri. I agree they need to rephrase their information. Pretty much. Remember Graf Zepplin? One team put it on sale, apparently without telling anyone else at WG. And they're still dealing with the resulting fallout. Well I'm not expecting a ship from every Santa's gift. I just don't want duplicate credit for ships I own if I don't have all the ships on the list yet. I want a different ship from the list like their website says. "have collected all the ships that have a chance of being dropped in Santa's containers"
Seems perfectly clear to me.........It doesn't say "Having collected all the ships we choose"
This appears to be a straight up contradiction @Femennenly care to chime in? Wait, so you are telling me that I don't have a chance to collect the ships on the list? Then why list them? I'm going by the list, not by just randomly picking ships. I don't have all the ships on THE LIST they posted yet. Either the WG post is wrong, or the response from customer service is....But clearly, they are somehow not providing a replacement ship if you don't have it all the time. Yeah they are saying the ships SPAWN in the lootboxes BEFORE you open them. So if you buy a lootbox, buy a ship from the tech tree, open the lootbox after and it's the same ship, you will receive credit because "it was in the lootbox before you opened it". At the start, I was missing about 20 ships. I actually never got a dupe, all the way to the end. I believe this is a rough idea of how it works. If you buy a set of 20 boxes and you were to get 3x dupes in that set, with the exception of the common ships, you would get them randomized. However, in the case that you don't have, for example, common ship Nueve de Julio, you could potentially get 3 Nuve de Julio in this set if your luck was really bad, because it doesn't do the reroll on the fly and counts you as not having the Julio. 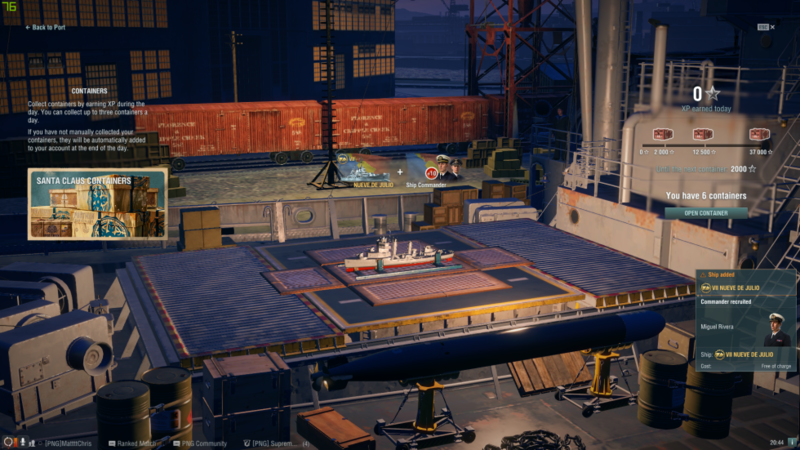 If you do have Nueve de Julio already, however, and it is actively in your docks, then this becomes rerolled through normal supercontainer rules. 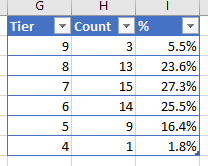 There is another case in previous years where you could seed your results if there was only one ship left in the pool to continually provide dupes of that. This was back in 2016 and likely no longer happens. I have a video from back then that documents it though. Basically, I sold my Tirpitz and then bought 20 boxes with Tirpitz being the only ship left in the pool. I ended up getting 4 Tirpitz, so 1 was returned to me, and 3 more were turned into doubloons. Since then, however, with the changes in logic and probabilities, it is no longer advisable for you to literally gamble your money for doubloons. Could be possible that maybe there is different sets of premium ships based on their tier. So if for example you got all the tier 6 ships on the list already and if the Santa crate rolled a tier 6 set, then it won't swap for a different tier since the coding made it a tier 6 set only since there are different probabilities for getting different tier ship sets. It will swap for a different tier. The majority of my ships were Tier 5, then Tier 6, then Tier 7, and then at the end I only had Tier 8s and Tier 9s in the loot pool. I believe the lower tiers are weighted higher to prevent the Musashi and Kronstadt from being given out too early on a high chance, as I only got those ships when I had 6 or 7 ships left in the pool. This is the flat probability by percent. I ended up cleaning out 75% of the pool before I got Musashi, and I had 3 ships left (2 T8 + Kronstadt) when I got Kronstadt. I had very good luck with the boxes and received only ships I did not have until I collected all the available ships. Then as expected I received duplicates and was compensated in doubloons for those dupes. I dont see an issue here. Sounds like OP bought a bunch of loot boxes and then didnt open them. Then he goes and buys some premium ships and is unhappy when same ships ended up in his unopened crates. WG never said they would continually monitor your port to ensure unopened crates didnt produce dupes, only when the crates were originally purchased. They also never said the ships were generated on purchase. Or if they did, then I missed it. All they said was if you opened a box with a dupe ship, you would switch ships. So I assumed that to be true. They never said anything about when you purchase them, only that if it was a dupe when you OPEN it. "If you get a ship that you already own, it will automatically be swapped for a different ship from the list.﻿"
@Shaddow_Ghost When you buy a crate of any kind, what is in the crate is what you get! The contents of the crate is not decided when you open it. The contents are decided when you buy it! The Santa Crate write up states that if you already have the ship that is in the crate when you buy the crate the ship will be replaced with a ship you do not have and the crate will become a Super Container. If you have all of the listed ships already then the ship contained in the crate will display but you get the doubloons, port slot and Captain. If you bought several crates did not open them and then bought ships they contained it is no wonder got duplicates! Yeah I'm aware now. Too bad the website didn't say anything about buying the crates AFTER you purchase ships. I just assumed the crates spawn the rewards when you open them. I wasn't told otherwise until support said so. Too bad they don't make this info available on their website.